This book shows the consistency between Romans 8 and Revelation, proving the first century fulfillment, and Responds to the Critics! In the previous installments in response to Lance Conley, I have shown how he absolutely, 100% ignores the context of Romans 8:18f in his attempt to refute my article on Romans 11, and to maintain his futurist eschatology. Be sure to read those previous installments – #1 #2. And the stunning fact is that Conley has now openly admitted that he ignored those context setting, context controlling motifs! That raises the question – once again – of how anyone can claim to have done a proper exegesis of any text, while admitting that they ignore the context of that passage? This is literally unbelievable. What has been Conley’s response to the previous two articles? He has called them “word vomit.” He has claimed that my articles are diversionary from his article. Nothing could be more false, as just stated. Again, he admits that the context setting motifs were ignored by him. And yet, while admitting that the context setting motifs are the very tenets that I have been discussing he says that my discussion of those context controlling subjects is “diversionary.” This powerfully illustrates that Conley knows, knows full well,. That he has not touched my arguments and that by ignoring those contextual controls, his discussion of Romans 8 is false. 1. The sufferings of Christ– the filling up of the measure of martyrdom on the part of the first century saints, and the crucial, critical role of the apostles. 2. The motif of the Shame Versus Glory mind set, world view of the ancients. To be persecuted, downtrodden, defeated, was shame. To be vindicated, to be victorious, was to be glorified. It was to be raised from the dead! 3. The motif of the coming manifestation of the sons of God as it related to that suffering and martyrdom. These three motifs are absolutely inter-related and, most importantly, they are right there in the text of Romans 8. Yet, to reiterate, Conley said not one word about these subjects and motifs. Literally not a word. He said he purposefully ignored them! What I want to do now, as we continue Responding to the Critics, as promised, is to explore the book of Revelation as it relates to these three key motifs found in Romans 8:16f, and the numerous other passages we have examined. I will try to keep this brief but it is critical to see the absolutely consistent themes in the epistles and in Revelation. That City was the city “guilty of all of the blood shed on the earth” (Revelation 18:20, 24). a direct citation of Jesus’ words in Matthew 23. It is the city that had killed the prophets (Revelation 16:6). No other city than Jerusalem did that. Jesus said, “It is not possible that a prophet perish outside of Jerusalem” (Luke 13:33 ). He did not mean that in some woodenly literalistic sense, but was illustrating how Jerusalem was the fountain of persecution. The man named Saul, later Paul, is a classic example. He traveled to far away Damascus, with “letters of authority” from the Sanhedrin, to persecute the saints. Therefore the wisdom of God also said, ‘I will send them prophets and apostles, and some of them they will kill and persecute,’ that the blood of all the prophets which was shed from the foundation of the world may be required of this generation, 51 from the blood of Abel to the blood of Zechariah who perished between the altar and the temple. Yes, I say to you, it shall be required of this generation (Luke 11:49-51). For you, brethren, became imitators of the churches of God which are in Judea in Christ Jesus. For you also suffered the same things from your own countrymen, just as they did from the Judeans, who killed both the Lord Jesus and their own prophets, and have persecuted us; and they do not please God and are contrary to all men, forbidding us to speak to the Gentiles that they may be saved, so as always to fill up the measure of their sins; but wrath has come upon them to the uttermost (1 Thessalonians 2:14-16). Babylon was the city whose internecine history has now filled her cup of sin with the blood of the saints and her judgment is at hand – just as in 1 Thessalonians and Matthew 23. Jesus’ words and Paul’s are definitive on this. Where is the evidence that John radically departs from that consistent testimony and identification to talk about different persecutors, different generations, different apostles and prophets being persecuted, and a radically different Day of the Lord? In Revelation 6, the martyrs cry out for vindication (CF Luke 18). They are promised that they will only have to suffer a short time more, just as Peter promised his suffering audience that they would only have to suffer a short time more (1 Peter 1:5f / 5:9f). Those saints were promised vindication at the Great Day of God’s wrath, just as Paul promised the Thessalonians vindication – and Glory – at the Day of the Lord! 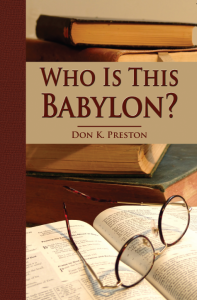 What would happen when Babylon was judged and destroyed? The saints’ shame is turned to glory, just as in Romans 8 and just like in 2 Thessalonians! The Old Covenant Seed has been shown who it is that the Lord identifies as His people. This is the manifestation of the Sons of God! So, we have in Revelation (and the rest of the NT corpus) a consistent, powerful, unbroken theme of the then present persecution of the saints at the hands of the Jews who rejected Jesus as their Messiah. But, we also find the consistent promise that those who rejected Him would be “utterly cut off out from among the people” (Acts 3). That means that just like Revelation 3, the true “the people” were to be manifested when the rebels were “utterly cut off”– and that was patently AD 70. \Keep in mind that Romans 8 was written at the same time as these other epistles and is discussing the identical motifs: The sufferings of Christ, filling the measure of suffering, filling the measure of and sin (implied) on the part of the Jews as the persecutors, Son Ship, Shame Versus Glory, imminent vindication, imminent relief. There is no distinction or temporal separation of millennia or generations between Matthew 23, 1 Thessalonians (or 2 Thessalonians 1) and the Apocalypse. (In a stunning revelation of Conley’s desperation that when I asked him if Jesus came, in the lifetime of the Thessalonians and gave them relief from their then on-going persecution at the hands of the Jews, he said No. Jesus did not come as Paul promised and predicted! Thus, in Conley’s desperation to hold onto a futurist eschatology, he labels Paul a false prophet or a liar). In light of all of this – and much more could have been said – it is manifestly clear that Lance Conley evidently does not know of the context of persecution in Romans 8, or he does not care about that motif, (admitting as much when he admitted that he purposefully ignored the issue) in which case his presuppositional theology is over-riding actual, honest exegesis. I say again that to ignore or discount the connection between “the sufferings of Christ” and Paul’s paranesis based on their then present suffering (not some far distant suffering of the church millennia removed) and the coming imminent glorification (The Shame Versus Glory Motif) is an abuse of exegesis and sloppy hermeneutic. Since Lance Conley openly admitted to ignoring these context setting, context controlling motifs, we have every right to totally reject his entire article, as an example of presuppositional, a priori argumentation that has no merit.